Querying an address’ balance with libbitcoin-client is a rather straight forward process. If you haven’t already installed libbitcoin-client, click here to learn how. 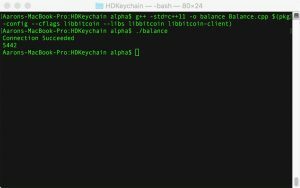 Now, to check an address balance we’ll need a function to make calls to a libbitcoin-server(BS), a function to parse the outputs into a balance and the main function to set the address to check. I’ve created a file called Balance.cpp and included the usual headers and namespaces. 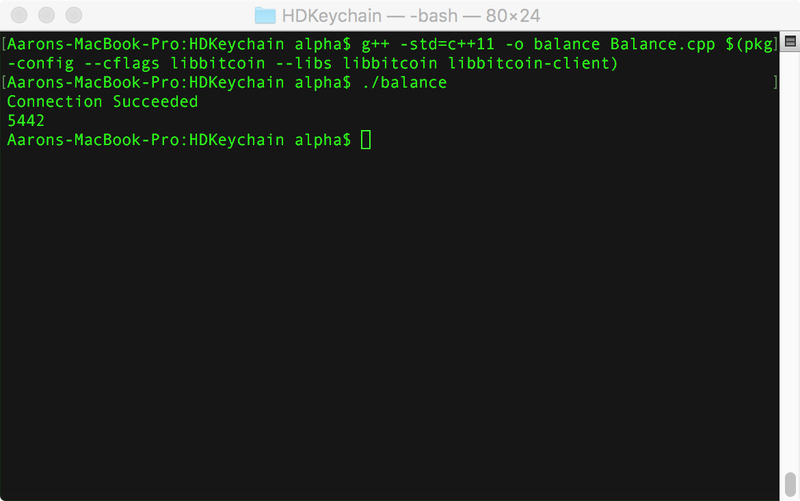 Now, the function to call the server is very similar to the tutorial on how to fetch the current blockchain height, making use of the connection struct to set the connection settings before instantiating an obelisk_client object with those settings. Now, for this call two callback handlers are necessary on for the response and one for the error. The on_error handler will simply display the error message returned by the server. The response handler is going to return chain::history::list object of all the outputs associated with the address both spent and unspent, thus the need for a separate parsing function. In our handler were just going to pass the history object to a different function and display the balance that is returned. Again, note the use of libbitcoin’s encode_base10 function for placing the decimal in a uint64_t number. Finally, to finish off the BS call, we simply connect the client to the server and use the fetch history function passing our address and handlers as arguments. With that, all we need to do is set the address in the main function and call our getBalance function. For the full sample code for all tutorials, please visit the LibbitcoinTutorials repo on github. When I compiled the balance.cpp I got the following error. Can you tell me what’s going on? Can you show me the code you are using? It looks like the compiler is not properly linking to the “history” struct, but I cannot recreate your error. Are you including and namespacing the necessary libbitcoin libraries? Oh, I can’t paste the code here. The comment box will miss the #include part of code. The first error thrown is, I think, because auto_pointers are deprecated in c++11 yet still used by older versions of boost to implement smart pointers. If you’re using an older version of boost with a current libbitcoin release updating boost may help. Other aspects of this post need updating such as the libbitcoin-server testnet port(19091) and the fetch_history2 function needs to be updated to fetch_history3. Make sure you’re including the proper linking flags when you compile. Also, feel free to open an issue on the tutorial github repo if you have any more questions, they have better code markup options.